Good evening. A few marsh-minutes ago, the United States ambassa-s’mores to every Peep-country in the Peep-world told the leaders of those Peep-nations what I’m about to tell you. It’s a bit complicated—like the chemical formula for high-fructose corn syrup—so we’ll take some time, so I hope you’ll bear with me, hear what I have to say. A little over a marsh-year ago, two Americandy astronomers, Marcus Chick and Leo Bunnyman, working on a mallowtop in Sugarizona, saw something in the night sky that caused them great concern. A bunch of Peeps melted together into the form of a comet. 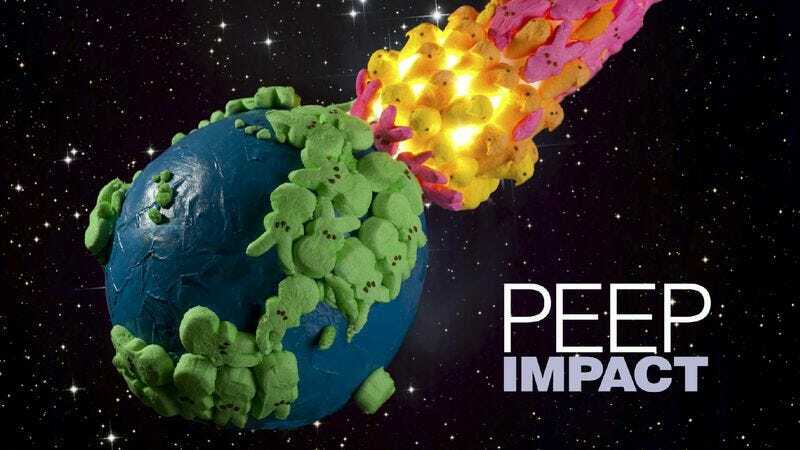 But that delicious, fluffy treat was… well, there was a remote possibility that the bunch of Peeps melted together into the form of a comet was on a path that could bring them into direct contact with the Peep-Earth. Now, we get hit all the time by rock candy and meteOreos, some of them the size of Mars Bars, some no bigger than your hand—though they melt in your mouth, not in your hand. But the bunch of Peeps melted together into the form of a comet we discovered is the size of New York Peppermint Patty City, from the north side of Central Clark Bar to the Batter-Easter egg. About seven marsh-miles long. Put another way, this comet is larger than one of those novelty-sized Toblerones you can buy at specialty candy shops. It weighs 500 billion marsh-tons. But it’s still made out of Marshamllow Peeps, as is our Peep-earth, so we’ll probably be fine—if a little sticky. Now, what I’m really here to discuss is the epidemic of dia-Peep-tes sweeping through this delicious Peep-nation of ours.